Activated carbons CNR, 208 and R2 have been already characterized in a previous work.10 Briefly, these three activated carbons posses a well-develop microporous structure, as deduced from N2 isotherms at 77 K. However, while carbon CNR exhibits a wide pore size distribution with a BET surface area of 1,834 m2 g-1 and a total pore volume of 0.95 cm3 g-1, samples 208 and R2 have a similar porous structure with a narrow pore size distribution, BET surface area of 1,274 m2 g-1 and 1,183 m2 g-1 and total pore volume of 0.56 cm3 g-1 and 0.60 cm3 g-1, respectively. Surface chemistry analysis of these carbons using temperature-programmed decomposition experiments denotes important differences in the amount and nature of oxygen surface groups depending on characteristics of the sample. In this sense, carbon CNR exhibits by far the highest amount of oxygen surface groups, these groups being mainly evolved as CO and attributed to decomposition of phenol, ether and carbonyl/quinone groups.1112 The total amount of oxygen evolved as CO2 and CO was 872 and 4,326 ^.mol g-1, respectively. TPD profile for carbon 208 exhibits also low and high temperature decomposition peaks although with a lower contribution (422 ^.mol g-1, as CO2 and 681 ^mol g-1, as CO) as compared to carbon CNR. Finally, carbon R2 exhibits a poor surface chemistry with only 64 ^.mol g-1, evolved as CO2 and 160 ^mol g-1, evolved as CO. In summary, activated carbon CNR exhibits by far the highest surface area and the highest amount of oxygen surface groups evolved both as CO and CO2. On the contrary, carbons 208 and R2, although having a similar porous structure, exhibit important differences in the surface chemistry. 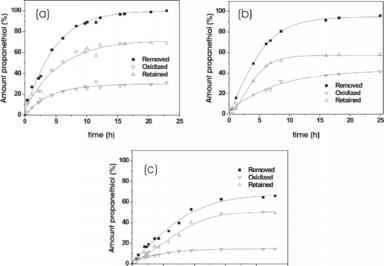 Consequently, an appropriate comparison and inter-correlation of these three samples will help in defining the effect of porous structure and surface chemistry for the liquid phase removal of propanethiol. The kinetics of propanethiol removal from a liquid solution containing 168 ppm S in «-hexene has been studied for the three activated carbons. Figure 1 shows the removal kinetics together with the analysis of the amount of propanethiol oxidized and released to the solution, and that retained on the carbon surface (as propanethiol and/or dipropyl disulfide). As it can be observed in Figure 1, the kinetics of propanethiol removal differs considerably depending on the nature of the activated carbon. In this sense, while carbons CNR and 208 show faster removal kinetics with mainly 100% efficiency after 25 h, carbon R2 achieves only 60% removal with a slower kinetic behavior. The kinetics and total removal capacity can not be exclusively explained by the porous structure (compare carbon 208 and R2 with similar porous structure) because of the presence of associated oxidation processes of propanethiol to dipropyl disulfide (DPDS). Interestingly, in all samples the DPDS formed is immediately released to the solution, thus, providing free surface sites able to adsorb more propanethiol and, finally favoring the removal kinetics. Taking a closer look to the amount of DPDS formed, it can be observed that the oxidation ability decreases in the order 208 > CNR > R2. The lower oxidation ability of carbon R2 can be explained by its poor surface chemistry (considering that the oxygen surface groups are responsible for the oxidation reaction); however, the comparison becomes more difficult for samples 208 and CNR (carbon CNR exhibits by far the highest amount of oxygen surface groups). Thus, from these results it is clear that not the amount but mainly the nature of the oxygen surface groups seems to be responsible for the oxidation reaction. Figure 1. Kinetics of propanethiol removal for activated carbons (a) CNR, (b) 208, and (c) R2 at 303 K. Additionally, the amounts of propanethiol oxidized and retained in the carbon are also included. [S]o: 168 ppm. The high facility of the activated carbons to release DPDS to the solution almost from the beginning is somehow in contradiction with gas-phase experiments where some authors proposed a higher adsorption strength for the oxidized product (DMDS) due to its larger size and higher boiling point.6 This result confirms that the presence of spectators (solvent) provides a different scenario for liquid phase removal experiments. Figure 2. 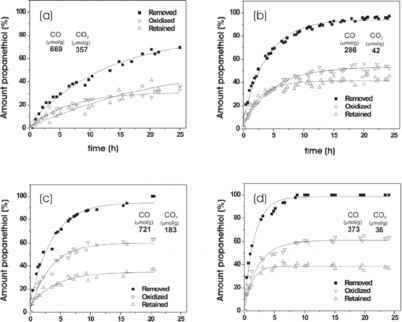 Kinetics of propanethiol removal for activated carbons (a) R2 and (b) R2/CO2 at 303 K. Additionally, the amount of propanethiol oxidized and that retained in the carbon is also included. [S]o: 168 ppm. The re-activation treatment of carbon R2 produces an important increase in the kinetics of propanethiol removal as inferred from Figure 2. These results clearly show that on activated carbons with a low oxidation capacity, the propanethiol removal kinetics and the total removal capacity are basically defined by the porous structure. Thus, the kinetics and total amount of propanethiol removed from the liquid phase and retained on the carbon surface will depend on the total adsorption capacity of the carbon sorbent. Previous studies on gas-phase removal of organic sulfur compounds have shown that carbon materials are able not only to adsorb but also to oxidize mercaptan molecules to disulfides.4-6'13 Furthermore, several studies described an important promoting effect of the surface chemistry (oxygen and nitrogen surface groups), the presence of water and of metal ions constituent of the ash in the oxidation process. 4,5,14-16 In order to get more insight into the effect of the surface chemistry on the oxidation ability of activated carbons, samples R2 and R2/CO2, both exhibiting a low oxidation capacity, have been submitted to an oxidation treatment with HNO3 followed by a thermal treatment in He at 973 K. As expected, the oxidation treatment produces an important increase in the amount of oxygen surface groups evolved both as CO and CO2 (see inset in Figure 3). A subsequent thermal treatment in He at 973 K produces the partial removal of the oxygen surface groups, this effect being more detrimental for the less stable (more acidic) groups. 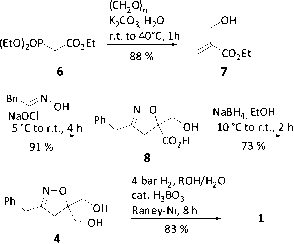 After characterization, the modified carbons have been tested in the removal of propanethiol (see Figure 3). Figure 3. Kinetics of propanethiol removal on carbons (a-b) R2 and (c-d) R2/CO2 at 303 K after an oxidation treatment with HNO3 (a-c) and after a subsequent thermal treatment in He at 973 K (b-d).10 Additionally, the amount of propanethiol oxidized and that retained in the carbon is also included. [S]o: 168 ppm. The oxidation treatment of carbon R2 produces mainly no effect in the removal kinetics and total removal capacity. On the contrary, carbon R2/CO2 exhibits a slight decrease in the removal kinetics, most probably attributed to the presence of steric hindrance in the pore mouth by newly created oxygen surface groups. This treatment also produces an important increase (two- or threefold increase) in the oxidation capacity of both samples, a clear indication of the critical role of surface oxygen in the formation of DPDS. Interestingly, a subsequent thermal treatment in He at high temperature (973 K) produces in both samples an increase in the propanethiol removal kinetics, probably due to the expected carbon gasification and, contrary to the expectations, it has no effect or even a slight increase in the oxidation ability. In summary, these results confirm that: (i) the oxidation of propanethiol to DPDS requires the presence of specific oxygen surface groups, (ii) these groups are located in the inner porous structure, i.e. the decomposition of groups produced by He favors the accessibility of propanethiol and, thus, increase the amount of DPDS formed and (iii) the high stability of these groups to a high temperature treatment indicate that the less acidic groups (most probably quinone groups) seem to be responsible for the oxidation reaction. The oxidation of mercaptan to disulfide at room temperature on carbon materials has been widely described in the literature for gas-phase experi-ments.4613 It is clearly stablished that the oxidation reaction proceeds via oxygen adsorbed from the gas phase,5,6 with water and disulfide as final products. However, the absence of an external oxygen supply for liquidphase experiments enhances the critical role of dissolved and/or chemi-sorbed oxygen in the oxidation reaction. The role of dissolved oxygen in the oxidation process has been ruled out in this work by performing kinetic experiments on propanethiol/«-hexene solutions previously saturated with O2 or N2 (after bubbling oxygen or nitrogen through the solution for 20 min). In all cases, the oxidation capacity of the carbon sorbent was independent of the saturation pre-treatment. For the second hypothesis, as chemisorbed oxygen is a limiting factor, i.e. there is a limited amount of oxygen in the reaction system, one would predict a limit in the extent of the oxidation for liquid-phase adsorption experiments. In order to check this effect of chemisorbed oxygen, activated carbon 208, which exhibits the highest oxidation ability, has been used in fixed-bed adsorption/breaktrough experiments. Figure 4a shows the break-trough curve for propanethiol adsorption and oxidation on activated carbon 208 at room temperature. Figure 4. (a) Fixed-bed adsorption/breakthrough experiment on activated carbon 208 at 298 K. The amount of propanethiol removed and oxidized is reported versus time on stream ([S]o: 467 ppm). (b) Temperature-programmed decomposition (TPD) spectra of activated carbon 208 after the breakthrough test (after 35 h time on stream). In the case of H2S, the deactivation was attributed to the deposition of elemental sulfur on the surface of wood ash and activated carbon, as deduced from XRD. In the oxidation of methyl mercaptan, the deposition of dimethyl disulfide on the activated carbon surface, which is more strongly adsorbed than MM due to its larger size and higher boiling point, was proposed as responsible for the deactivation observed. However, contrary to the behavior on activated carbon, Kastner et al. observed no decline in the oxidation activity of methyl mercaptan to disulfide when using wood ash.13 For liquid-phase adsorption experiments, no data can be found in the literature about this deactivation process. However, the deactivation in the oxidation of propanethiol to dipropyl disulfide must be due either to the deposition of DPDS or to the consumption and exhaustion of chemisorbed oxygen (as surface groups) due to the absence of an external oxygen supply. The first hypothesis can be ruled out from the results reported in previous sections. Contrary to the behavior in gas-phase experiments, in liquid-phase studies DPDS is released to the solution already in the first minutes of the analysis. Thus, for liquid-phase experiments, the presence of other species, i.e. the solvent, must be responsible for the desorption of the disulfide from the carbon surface. Consequently, chemisorbed oxygen consumption must be the reason for the deactivation observed in the oxidation process. In order to confirm this point, activated carbon 208 was submitted to a temperature programmed decomposition experiment (TPD) after being used for 35 h in fixed-bed adsorption experiment. Figure 4b shows the H2O (m/s 28), CO (m/s 28) and CO2 (m/s 44) profiles as a function of temperature (fragmentations coming from n-hexene, propanethiol and DPDS have been appropriately subtracted from the m/s 28 and m/s 44 signals). The TPD shows the evolution of CO2 (at low temperature) and CO (at high temperature) typical profiles of an activated carbon.9 Interestingly, the TPD exhibits three water desorption peaks. Comparing the amount of CO, CO2 and H2O evolved in Figure 4b with those of the original 208 activated carbon (CO: 681 ^mol/g; CO2: 422 ^mol/g and H2O: 56 ^mol/g), there are important differences. While the amount of CO exhibits a nearly threefold decrease, the amount of CO2 remains mainly unaffected. Additionally, this decrease in the amount of oxygen evolved as CO is accompanied by a tenfold increase in the amount of water. Considering the reaction mechanisms proposed in the literature, water and DPDS would be the expected reaction products. In the same way, oxygen surface groups would be expected to be consumed in the oxidation reaction from propanethiol to DPDS. From a quantitative point of view, the TPD data show that only those oxygen surface groups evolved as CO are consumed in the breakthrough column experiment. The consumption of a specific type of oxygen surface groups (436 ^mol CO/g) would confirm experimentally the hypothesis proposed above, i.e. only the more stable oxygen groups participate in the oxidation reaction (quinone groups). Additionally, the formation of water (518 ^mol H2O/g of activated carbon) after the breakthrough column experiment would also confirm that (i) water is also a final product in the oxidation reaction and (ii) water is preferentially adsorbed on the carbon surface (maybe the more strongly adsorbed water is responsible for the progressive desorption of the dipropyl disulfide formed). Interestingly, the amount of CO consumed and H2O formed on carbon 208 during the breakthrough column experiment are very close to the total amount of dipropyl disulfide formed (367 ^mol DPDS/g) in the same experiment (after the 35 h time on stream), as detected by gas-chromatography. Thus, from these results a stechiometry for the oxidation reaction of (2:1:1) for propanethiol, dipropyl disulfide and H2O is proposed for liquid-phase adsorption/oxidation experiments. Additionally, the TPD profile exhibits desorption peaks (not shown) for n-hexene, with a single contribution centered at 419 K, and for propanethiol, with two maxima centered at 671 and 733 K. No peaks corresponding to dipropyl disulfide were observed. These results confirm that, contrary to the behavior in gas-phase adsorption experiments, DPDS is weakly adsorbed on the carbon surface in liquid-phase experiments and thus, it is released to the solution almost from the beginning. It is noteworthy to mention the high temperature observed for the desorption of water from activated carbon 208 after the column test, as compared to the original sample (single H2O desorption peak at 398 K). These differences in the desorption temperature for water denote a difference in the nature of adsorption, i.e. while the water in the original 208 activated carbon is weakly adsorbed (physisorbed), on the already used activated carbon the water, coming from the oxidation reaction, must be strongly adsorbed (chemisorbed) as it corresponds to a reaction (formation) mechanism between chemisorbed oxygen and H+ coming from the initial dissociation of propanethiol.